The latest updates from our Research team. This is the sixth in our series of blogs on getting started with AYLIEN’s various SDKs. If you’re new to AYLIEN and you don’t have an account yet, you can go directly to the Getting Started page on the website which will take you through the signup process. We have a free plan to get started with that allows you to make up to 1,000 calls per day for free. Once you’ve installed the SDK you’re ready to start coding. For the remainder of this blog we’ll walk you through making calls and show the output you should receive in each case. Taking simple examples we’ll showcase some of the API’s endpoints like Language detection, Sentiment Analysis and hashtag suggestion. Once you’ve received your AYLIEN APP_ID and APP_KEY from the signup process and have downloaded the SDK you can begin making calls with the following imports and configuration code. 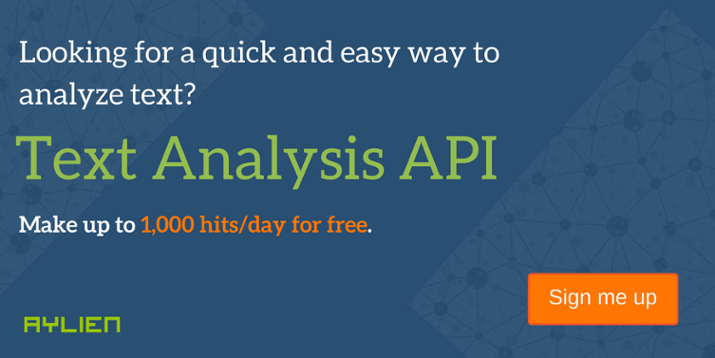 When calling the various API endpoints you can specify a piece of text directly for analysis or you can pass a url linking to the text or article you wish to analyze. To do this, you can call the endpoint using the following piece of code. You should receive an output very similar to the one shown below. This shows that the language detected was English and the confidence that it was detected correctly (a number between 0 and 1) is very close to 1, which means you can be pretty sure it is correct. Text : "What language is this sentence written in?" You should receive an output similar to the one shown below which indicates that the sentence is objective and is positive, both with a high degree of confidence. Text : "John is a very good football player!" Finally, we’ll look at analyzing a BBC article to extract hashtag suggestions for it with the following code. You should receive the output shown below. If Java’s not your preferred language then check out our other SDKs for node.js, Go, PHP, Python, Ruby and .Net (C#). For more information regarding the APIs go to the documentation section of our website. Subscribe to our newsletter to recieve regular updates about AYLIEN, direct to your inbox. A legal convert with a masters degree from Smurfit Business School, Mike runs our Sales and Marketing at AYLIEN. Mike gathered his Sales and Marketing experience with technology companies in Sydney and Dublin before getting the startup itch and joining the team at AYLIEN. Copyright © 2018 Aylien Ltd. All rights reserved.